Spikes typically form when the ambient air is well below 0 degrees Celsius, allowing for rapid freezing—an air temperature of about –7 degrees C (20 degrees Fahrenheit) turns out to be optimal. ... 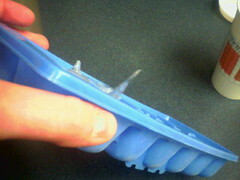 Pure water works best for spike formation, as does a container with vertical sides, such as an ice tray. 1. We had our freezer set too cold. 2. The folks at DrinkMore should use this as an ad gimmick to prove how pure their water is.